Curves ahead! New PATH features a serpentine bridge, plenty of hills, and gorgeous views. For several years, the Arabia Mountain/South River/Rockdale River PATH Trail system has terminated at the beautiful Alexander Lake Trailhead in Panola Mountain State Park. Those who regularly ride this trail have enjoyed the scenery, restrooms, and other amenities associated with one of the busiest trailheads on the PATH system. In January, PATH, Georgia State Parks, and Rockdale County opened an additional 5.5 miles of trails beyond Alexander Lake. The new southern terminus of the trail is at the South Rockdale Community Park on Fairview Road. This trail is truly an “adventuride”! It weaves through a rolling forest, crosses several creeks, and affords beautiful views of Panola Mountain Park, the Atlanta skyline, and the South River shoals. The new serpentine bridge high above a carved-out creek will likely be a popular rest stop after negotiating the hills on either side of the bridge. The trail runs along the bank of the South River in several locations east of Union Church Road. In addition to the 5.5 miles recently opened, PATH and Georgia State Parks are partnering to construct several miles of trails within Panola State Park. One spur trail will duck through a historic barn, connecting the main trail to the Panola Mountain State Park Visitor’s Center and the new headquarters for Georgia State Parks. Another new spur trail will encircle Alexander Lake with a boardwalk over the stream feeding the lake. These two trails will be completed around May 1st. Check the PATH website for a precise opening date. Remember to be prepared for an adventure when visiting the trails around Panola Mountain. These trails offer a good workout with plenty of hills and valleys. Beware of native creatures crossing the trail. Stay on the trail and clear of rock outcroppings and fragile vegetation and keep in mind that Panola has a strong conservation ethic. 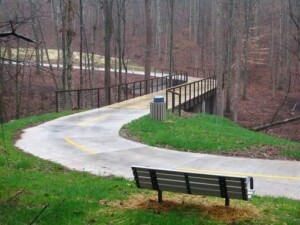 Funding for these new trails was provided by GADOT Transportation Enhancement Grants, Georgia State Parks and donations to the PATH Foundation. You can support the PATH Foundation through membership or a donation here.